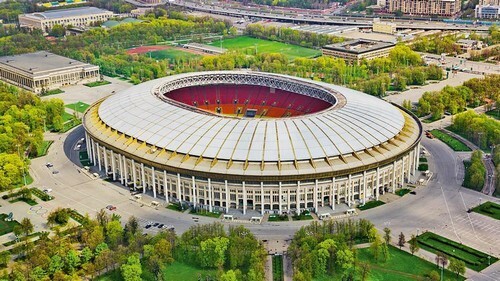 Luzhniki, the largest stadium in the former Soviet Union, has an illustrious history. The Soviet authorities planned the stadium to showcase the prowess of their athletes after the war. Once it was completed in 1956, it held a number of USSR-wide and international championships, though its crowning moment came during the Olympics in 1980. During that summer, viewers from around the world tuned in on their TV sets to watch Leonid Brezhnev, in Luzhniki’s presidential box, raise his hand to mark the start of the summer games. Luzhniki has undergone several renovations since its opening in 1956. The latest iteration, unveiled just last year, gave the stadium a roof that also functions as a 40,000-square-meter screen, which, among other things, has been used to broadcast a Russian flag to all air traffic flying over south-central Moscow. It remains Russia’s largest football stadium and is one of the largest stadiums in Europe. When constructing the stadium, the Soviets did not begrudge giving it one of the prime spots in Moscow; it is located in a picturesque site on the banks of the Moscow River. A cable car, whose opening will coincide with the World Cup, will ferry visitors over the river to a viewing platform atop the city’s famed Sparrow Hills, where they will we able to admire Luzhniki’s screen roof from above. Getting to Luzhniki is easy. The stadium is located at the junction of two metro lines, and the 10-minute walk from either the Luzhniki or Sportivnaya metro stations will take you down a treeand fountain-lined alley straight to the stadium. For a long time, Spartak did not have its own arena, and the team was forced to play its matches at other teams’ stadiums, including Luzhniki. That changed in 2014 when, financed by the team’s billionaire owner, the Spartak Stadium finally opened after many delays (construction began in 2007). There were numerous problems with finding funding and a proper site, as well as the design (which an architectural council rejected, citing its “featureless” facade) stalling the project (the finished stadium differs only in minor details from the original design). The completed stadium opened as the Otkritie Arena (it sheds its name for FIFA tournaments, which forbid corporate sponsorship). Spartak will continue to enjoy its new home after Russia 2018, and residential developments are planned for the surrounding area. The nearby Spartak metro station opened in 2014. The station was originally constructed in 1975 but was left unfinished for nearly 40 years. From the outside, the 45,000- seat arena bears a resemblance to a curled-up snake, with a facade made from scale-like red and white panels — the colors of the home team FC Spartak. Spartak takes its name from the Roman hero Spartacus, and a bronze statue of the rebel leader stands outside the stadium inviting spectators to take a selfie. You have a lot of options to get to Spartak stadium. The Spartak metro station is a 3-5 minute walk away. Alternatively, you can take a commuter train from the Kursky and Rizhsky stations to Tushino, located 7-10 minutes from the stadium. On game days, Moscow promises to have free shuttle buses running from Aeroport metro station and Sheremetyevo Airport.